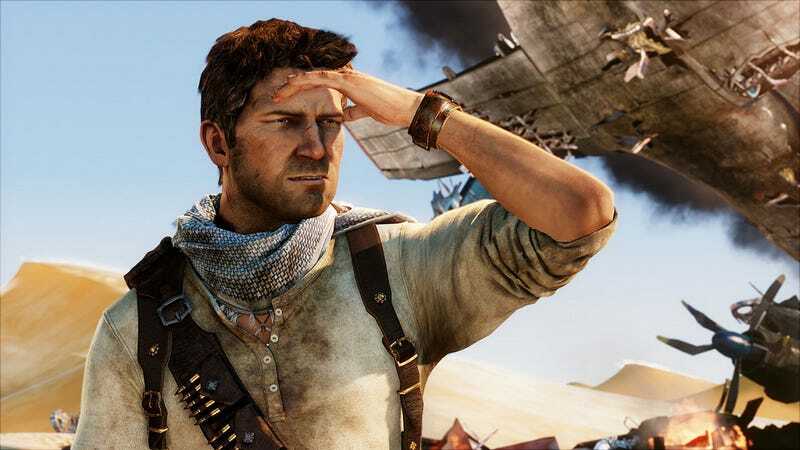 Searching For More Uncharted 3 Details? Since Entertainment Weekly revealed Uncharted 3: Drake's Deception this morning, the PlayStation Blog has updated with new information and images and box art has reared its likely placeholder head. Want to see? Entertainment Weekly had the scoop this morning on the third adventure of everyone's favorite swashbuckling treasure hunter. Drake's Deception will be taking our hero around the world in search of the fabled Atlantis of the Sands. EW even had a nifty trailer, which has since popped up over at the PlayStation Blog. Along with the trailer, the PlayStation Blog has also confirmed that the game will support stereoscopic 3D, while delivering several bits of fresh artwork, all revolving around Drake and a plane crash in the desert. The panorama shot also popped up on Amazon.com in a listing for Uncharted 3: Drake's Deception. Amazon lists a release date of December 1, 2011 for the game, but Amazon often uses placeholder release dates when they have no idea when a title is coming out, so take that with a grain of salt. Thanks to Dylan for passing along the box art. So we've got potential placeholder box art, some images of a plane crash, a far-too-short trailer, and a promise of improved multiplayer. Is that good enough for you folks?